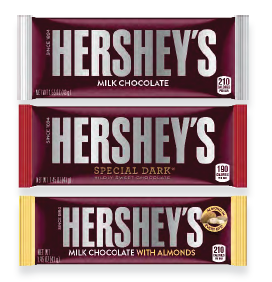 The Hershey Company is in the process of updating packaging graphics for its HERSHEY’S Milk Chocolate Bar, HERSHEY'S SPECIAL DARK Mildly Sweet Chocolate Bar, and HERSHEY'S Milk Chocolate with Almonds Bar to incorporate silver, maroon, or gold, respectively, onto packaging. This new, distinctive color addition may make it easier for consumers with food allergies to visually distinguish these three Hershey’s chocolate products that contain different allergens. This change will occur starting with the 1.45 oz HERSHEY'S Milk Chocolate with Almonds Bar in July 2016. Changes will continue throughout 2016 on the Standard, XL, Giant, King, and Snack sizes for these HERSHEY’S bar varieties and be completed by the end of 2017. It is important to emphasize that the allergen profile of these products is not changing. Only our 1.55 standard size HERSHEY’S Milk Chocolate Bar and 1.45 oz HERSHEY’S SPECIAL DARK Mildly Sweet Chocolate Bar contain no peanut or tree nut ingredients, are produced on a dedicated line that does not manufacture any peanut or tree nut items, and are made in a plant that does not process peanuts. As a result, they do not carry an Allergy Information Statement. Because ingredients or manufacturing processes can change, we always recommend that consumers continue to read the labels prior to purchasing our products. For more information, please contact The Hershey Company at (800) 468-1714.